This is another shot taken next to the Bridge Street Pier in Bradenton Beach, Florida. In the morning everything is quiet as the pier casts long reflections on the calm waters of the Inter-coastal. This is my favorite time of day to get photos of places that are normally much busier during the day. Next to me sat a couple on a bench drinking coffee and watching the sun rise. Not a bad way to start the day. I’ve taken a lot of pictures from here but when I take the time I can usually find a different perspective. So even if I’ve been here, the photo is unique in some way. I don’t mind repeating myself if I’m taking pictures of something pretty and I’m having fun. Whomever said you can’t repeat yourself forgot to send me the memo. For me, photography is a state of mind more than anything. I have an idea what I want to convey, something peaceful, calm and serene. So no matter where I am I just figure out how to do that. If my inclination was to show some form of action or interaction, I’d take a completely different approach. Photography is a state of mind and if you constantly practice your images reflect that state of mind. That’s not to say I have a peaceful, serene and calm mind, but that yearning is what I focus on. 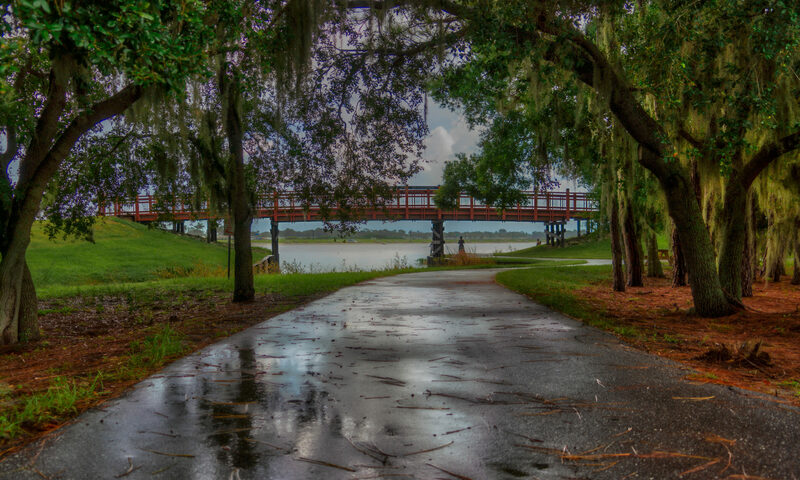 This is another one in a series of photographs I’ve taken of the Ringling Bridge. Close to home it’s one of my favorite subjects. I’m always looking for new perspectives and different angles of it. In this case I was a couple miles away at a little park called Nora Patterson Bay Island Park which is at the entrance to Siesta Key. Use of a telephoto lens allows me to frame end to end like this. I think the next time I come here it’ll be in the evening so I can get this scene after dark; I’m curious to see how that will look. This is the best time of year to be here in Florida. Its low season before the population expands with visitors and snowbirds. It’s also the time of year that we get a break from the heat, the weather is perfect, not too hot or too cold. So it was this perfect day with the perfect weather that I had this little park to myself. Imagine that, having this view to yourself, alone with your thoughts. I suppose its a common thing because its such a small park, but still, it’s quite the thing, don’t you think?